Maasai women have experienced high levels of marginalisation for many years. Examples of this can be seen in their lack of property ownership (including livestock), high mortality rates, low levels of education, forced marriages, heavy workloads and physical suffering. 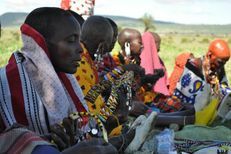 The Maasai community is very patriarchal, with minimal opportunities for women to challenge these circumstances or influence community decisions. For these reasons, Maasai women are among the poorest in Tanzanian society. Women's Solidarity Bomas (WSB) - The Women's Solidarity Bomas (WSB) project is the initiative that most defines the identity of PWC as a women’s empowerment organisation. The three WSBs in two districts facilitate their members to gain property rights and generate income through the ownership of property and revolving livestock projects. This is important in the context of Maasai society where women currently do not ordinarily own cattle in their own right. Each WSB functions as a revolving livestock exchange, where one woman receives goats and then later passes along an equal number of goats to another woman. The WSB also crossbreeds cattle to improve the health of cows in the area. The WSB promotes property ownership, income generation opportunities, and it helps gain community respect by demonstrating women’s abilities. Revolving Goat Funds - PWC has implemented revolving goat programmes in 8 locations in 2012. Through this process women are given four goats each and pass on the kids to another marginalised women. This process not only provides fundamental economic support and makes women less financially dependent on men but provides social mobility through property ownership and assist in wider attitudinal change towards women. Watch the video below made by Anne Oswald, PWC Volunteer about our goat projects. Food Security - PWC believes that all its economic empowerment work helps increase its beneficiaries food security. However, as the districts PWC operates in are increasingly affected by drought and restrictions on cultivation, PWC now also runs specific food security projects. These range from constructing grain stores in Longido district to the distribution of emergency food aid to children in response to the 2012 famine in Ngorongoro Conservation Area. Adult Literacy - Adult classes are conducted in PWC nursery classrooms twice a week, enabling women to learn about issues such as healthcare and farming. These classes also serve as an opportunity to discuss other issues they consider important. Water Projects - Our Water Projects, including the construction of earth dams, have had an instantly beneficial effect on the thousands of people who have been given access to safe drinking water.